For years the books we’ve used in my 7th grade English class have been dominated by white men and S.E. Hinton. While S.E. Hinton is a woman, women do not figure heavily in her novel The Outsiders. Though we love all of the books we use, and it’s harder to get a loved book out of the hands of an English teacher than it is to take a gun away from Charlton Heston, we’ve spent this year looking to expand. We’ve already added Sharon Creech’s wonderful novel Walk Two Moons which balanced the authors male/female but left things pretty white still. 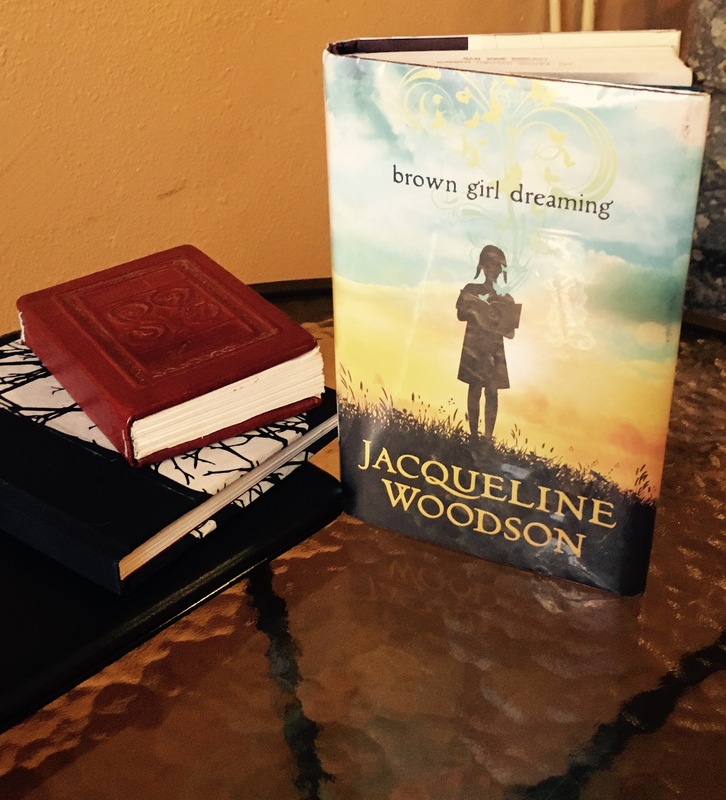 One book that kept coming up wherever and whenever I looked is Jacqueline Woodson’s Brown Girl Dreaming, a memoir of the authors 1960’s childhood written in blank verse. So that’s what I read over my spring break, even tho ugh technically it counts as working, which I try to avoid when on break. It’s my new favorite book. 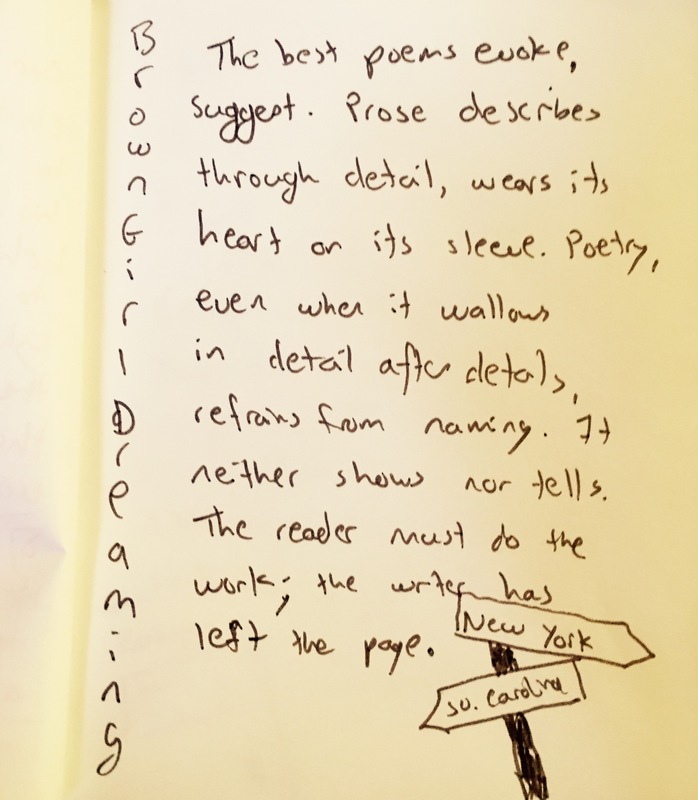 Blending poetry and memoir is kind of an odd thing to do in children’s lit. There are many, many verse novels in YA these days, many of them excellent, but this is the first one I’ve read that counts as non-fiction. I thought the technique worked very well. Memoir is often something that doesn’t really lend itself to dramatic tension, what keeps the reader engaged is often something other than narrative suspense. Memoir can drift along, from story to story, entertaining and moving the reader as it goes, without worrying so much about creating an overall narrative arc. Some readers find this problematic. 7th graders like dramatic tension and narrative arc’s though they have no idea what those two things are when you ask them on the test. Here the technique of memoir worked very well. The nature of the poems helped matters, too. They do connect to form an overall story, but they also allow the author to include quite a few things that might have ended up on the cutting room floor otherwise. In a series of poems, there is room for drifting away from the central “plot” now and then. Prose, in spite of its much wordier nature, wouldn’t give the author this freedom. The best poems evoke, suggest. Prose describes through detail, wears its heart on its sleeve. Poetry, even when it wallows in detail after detail, refrains from naming. It neither shows nor tells. The reader must do the work; the writer has left the page. they painted over the Whites Only signs. See what I mean about how the poems work. This could easily, and just as powerfully, be a prose piece but it would stand out as a stop in the narrative, a moment when the author forces us to pause so she can make a point. In poetic form, the young reader will have to do some work to figure out all that’s going on here, the way past habits can still influence behavior and feelings long after they have been painted over. The painted over nature of the sign is a topic for advanced readers. America never really dealt with segregation, never looked into the face of Jim Crow or slavery, just painted it over hoping it would go away. But many Americans still feel things standing in their way. 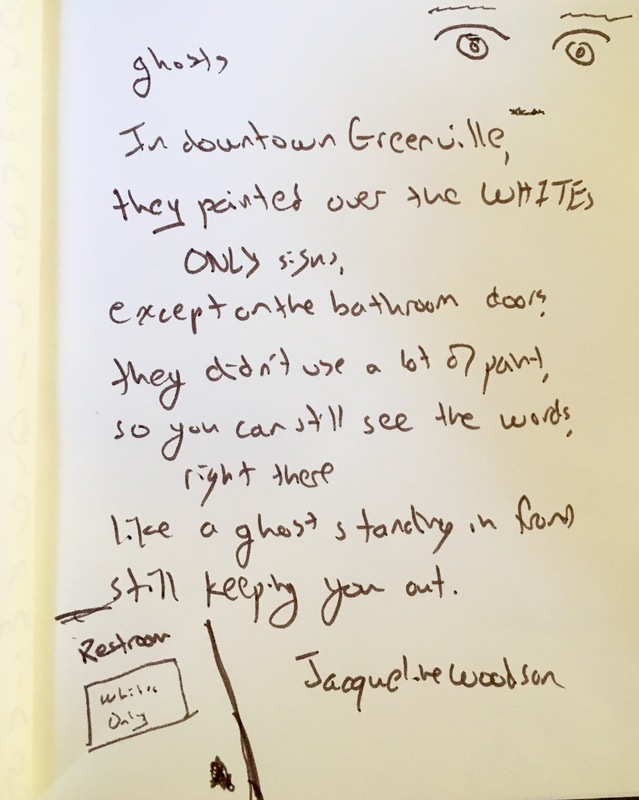 Did you think they used white paint when you read that poem? Ms. Woodson doesn’t say what color paint it was. So, I’ve already texted* the other 7th grade teachers. I plan on “forcing” the book on a couple of students to see what they think. It might be a little young for them. 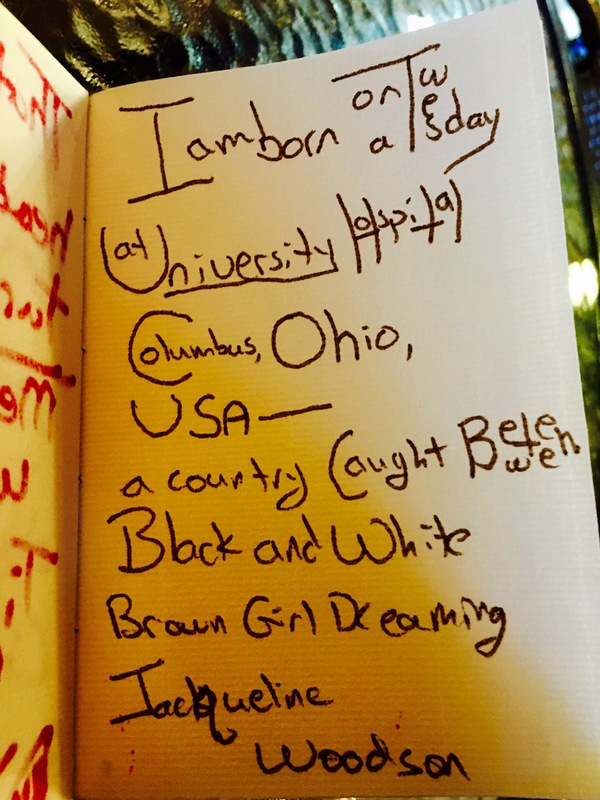 My biggest worry is that some sixth or fifth grade teacher is already using Brown Girl Dreaming. There’s no way I’ll ever be able to convince them to let go of it so we can use it at grade seven. I’d would have had better luck with Charlton Heston. *Yes, I just used the past tense form of text in a sentence. This is an amazing book and I think it could work for 7th graders. The audio version, narrated by the author, is excellent, too. Sounds fascinating, and I love the glimpses of your notebooks and am glad you’ve kept on with sharing those.